A forewarning: this post is very typical of Paris, we hit all the well-known spots (with the exception of the botanical gardens and some vegan cafes)... Arc de Triomphe, Eiffel Tower, Notre Dame, you name it. There's something about Paris, though, despite its bad-rep of dismissive locals, and overrun with selfie-stick tourist spots, that you just have to see and experience for yourself. Carrousel du Louvre is a lovely park area right across from the Louvre. A great place to grab a baguette and have a promenade (there are so many places like this in Paris!). Some walking and metro-ing took us through Palais Royal, famous for its controversial black & white columns, Notre Dame Cathedral, famous for being Notre Dame, Sacre Coeur, and of course, Arc de Triomphe and the Eiffel Tower. In the Louvre you can find the Mona Lisa and other pieces of famous artwork and history. Arc de Triomphe is a must see and fascinating structure in the middle of the most insane traffic I've ever witnessed. 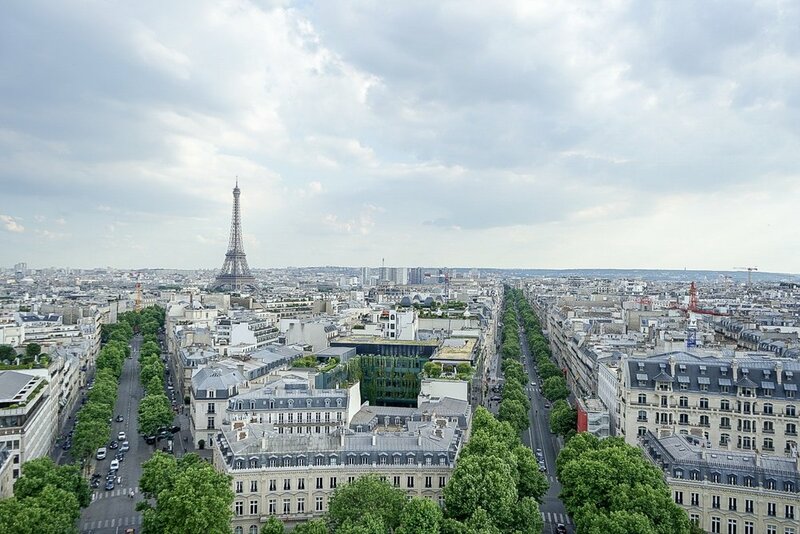 A beautiful view of the Eiffel Tower awaits you at the top. If you're under 25, your entrance is free. Luckily, I had another month before I turned 26. Winning! One of the best parts of our Paris experience was that we were able to do it with a local. Our friend, and Paris-native, Laura, assigned herself as our designated tour guide for the week. For transportation, we joined hundreds of other Parisians on the metro to and from the city center. Paris' metro line is the largest in the world! The Eiffel Tower speaks for itself. In addition to visiting during the day, make sure to see it at nightfall when the hourly light show starts. Vegan finds: the best vegan pastries! We tried them all, tarts, cookies, energy bites, and pies at Cafe Pinson! For dinner we went to Le Potager de Charlotte, near the Moulin Rouge.